I have two friends that I would consider my travel buddies. We’ve gone on at least three trips together, a host of concerts, and other outings beyond a cheap meal. They’re flexible, chill, and like-minded so we always have a great time together. However, not all of my friends are on that level. Don’t let Instagram fool you. Not everyone is able to just hop on a plane and go to Miami for the weekend. Nor is everyone able to schedule a vacation outside of tax season and actually go. So if you have some friends that are broke or have some slight financial struggle, the following three tips may be able to help them get to the vacation y’all deserve. Give the total price to your friends and divide the amount by the number of attendees. Let them know the cost if everyone that’s agreed to come actually comes and the cost if people start dropping out (because chances are, someone will). Then break that price up by 4 or 5 smaller payments that are timed around pay day and/or 2-4 weeks at a time. Send them a couple reminders leading up to the payment dates. This allows your friends to not have to pay $600 off at once, but make several $50 payments per pay period. It’s like y’alls trip to D.C. is a bag off QVC. Same thing. As the group treasurer, put this money in a separate account or make a new PayPal account where it stays until time to book the hotel room, vacation rental, etc. Don’t let this money end up accidentally paying your cell phone bill. But that’s another conversation for another day. If the vacation to Cancun is too expensive for your group, but y’all still want to go to the beach, think locally. There are plenty of beaches on the East Coast. If casinos are your thing, think Biloxi or Atlantic City instead of Vegas. You can really have a good time anywhere within budget if you look hard enough. 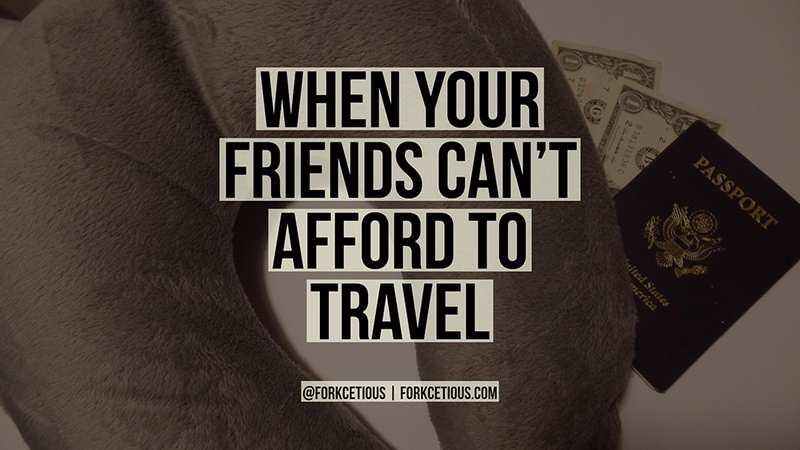 Trying to travel with broke friends is always going to be a struggle, no matter how you work it. You either have to hold their hand to make sure they can pay for the trip or change your plans altogether. And sometimes, they won’t be able to make it. It’s reality all parties need to be fine with as y’all move forward in the planning process.